Last Tuesday, June 28, WBNA’s Neighborhood Action/Crime Watch Committee held a first ever meeting on the street (thank District 4 Police Commander Lt. Fernandes for the idea!). Held at Major Park on Ellery Street, the event began at 6PM with a park clean-up. Before the meeting even started, the Parks Department hung a dog bag dispenser near the park monument just outside of the park to encourage a culture of clean and picking up after our pets. Huge thanks to the Hell’s Angels whose headquarters are located on the corner of Messer & Wendell Street just a block from the park. They took on cleaning the park monument and planting flowers and mulching around it. Take a look at how good the monument looks! Local kids, and adults, transitioned from the park clean-up to the meeting with a delicious ice cream break provided by the WBNA Neighborhood Action Committee. Neighborhood Action Crime Watch Committee Chair opened the meeting at 7PM and Lt. Fernandes presented the crime statistics for the last month. Concerns included a proliferation of graffiti which Alexandra Batista from Mayor’s Center for City Services would be taken care of by the graffiti task form (they had been cleaning the pools so got behind); concerns about fireworks in the coming week, 137 Carpenter Street which Lt. Fernandes reported was being deemed a nuisance house and would be getting an “orange” nuisance sticker. 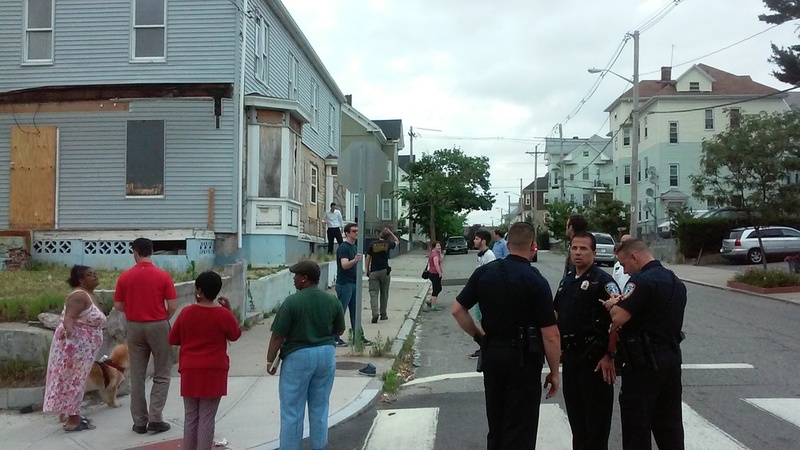 Following the Crime report, the group walk to 49 Ellery Street and 197 Chapin Avenue to view these derelict properties and to get an update on their progress. Deputy Director of the Providence Redevelopment Agency Sean Creegan gave an update on 49 Ellery Street. Councilman Principe explained how he got RIDOT to come out and clean 201Chapin Avenue as they are the owners. WBNA would like to give special recognition to Councilman Principe and to the Providence Parks Department for the great improvements to the park. The Councilman provided funds to install a full court basketball court last fall and a new climbing play structure has just been installed earlier this spring. Downcity Design is also working on a fun play and explore area. All the kids in the neighborhood are really excited about the improvements to their park, but there is still a lot to improve. The kids and parents in the community want lights in the park and more equipment for small children and toddlers. We hope to work with the community and this city on the lights as well as the plans to replace the chain link fence with something more welcoming.